Place macadamias, dates and sea salt into food processor and blend for 15-30 seconds on medium speed until well combined and forming a moist dough. (Thermomix 15 sec/ speed 5.5). When pressed mixture should hold together. Check saltiness, adjust if necessary – just a little to give it that little kick to bring out the flavours. Sprinkle desiccated coconut over the base of a 20cm spring form cake tin, press mixture to form an even base. Set aside. Place raw cashews, lime zest, limes, agave, coconut oil and water into food processor, or blender, puree together until smooth and creamy for 1 minute on high speed. Check sweetness and adjust if necessary. (Thermomix 1 min/speed 9). Pour the mixture over the base and set in the fridge, minimum 4 hours (or overnight). 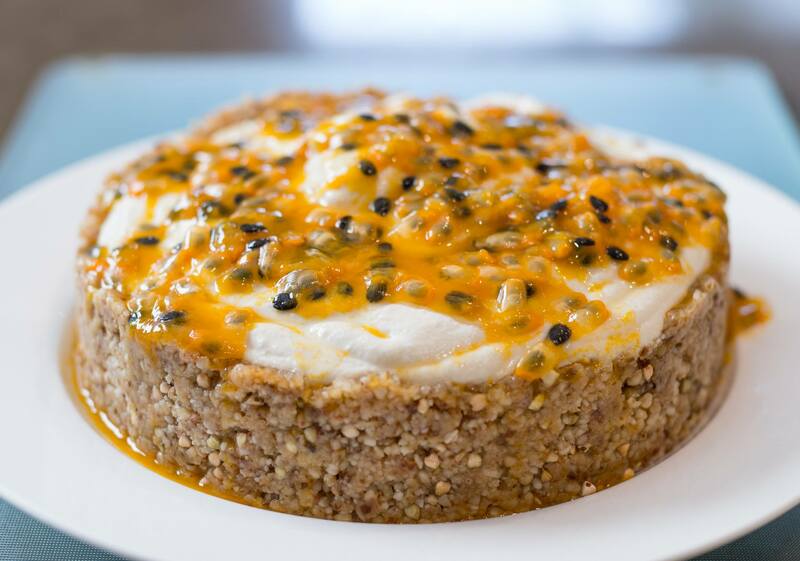 Remove from cake tin and decorate with additional fruit, here we have used passionfruit. Use any citrus fruit, lemon or orange are both nice, and adjust agave to personal taste. Cake can be stored 5 days in the fridge, or may be frozen in portions for up to 3 months. We suggest you wrap each portion and store in an airtight plastic container. Simply unwrap and allow to defrost 15 minutes prior to serving. Activated buckwheat is simple to do at home, or can be purchased as “Buckini’s”. To make at home, just soak buckwheat overnight, drain, pat dry and dehydrate until crisp in a warm oven or dehydrater. It is the edge this recipe has over hundreds of others, its about texture and getting that biscuit like crunch, you dont have to miss out on that in this RAW VEGAN recipe!